Once proclaimed "The next Spielberg", the career of M. Night Shyamalan has been quite the rocky one. A glimmer of hope came through 2015's The Visit, which showed the director was still able to put a foot in the right direction. 2 years later, and in spite of making pictures like After Earth and The Last Airbender, Split shows that M. Night hasn't lost the ability to deliver a good film. After a birthday party, Casey (Anna Taylor-Joy) is waiting to be driven home, sitting in the car with classmates Claire (Haley Lu Richardson) and Marcia (Jessica Sula). A mysterious man gets into the car and drugs them, resulting in their kidnapping. The three girls awaken, locked in a windowless room. 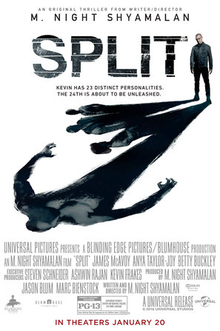 Their captor is Kevin (James McAvoy), a man with 23 personalities. His goal? To unlock a 24th personality, known only as The Beast. James McAvoy leads the proceedings, and he really tries with making each personality different. It could've been easy to put a half-hearted effort, resulting in merely putting on a different voice and changing the clothes, but as he goes from the quietly unnerving Dennis, to 9 year old Hedwig, McAvoy manages to put his own spin on each personality. Each one feels distinctive, with McAvoy making a unique performance for each shown personality. As with last year's The VVitch, Anna Taylor-Joy delivers a quietly stunning performance. Viewers may favour McAvoy's more showy performance, but it's almost criminal to overlook what she does in the role of Casey. A determined character, silently plotting her escape, looking for the right moment. A direct contrast to Claire and Marcia, who look for the first possible opportunity, no matter how poorly thought out it is. We also get Casey's backstory, as flashbacks are used in an effort to flesh out her character. It's apparent Shyamalan is trying to make a parallel between her and Kevin, and it can feel a bit too on the nose. With this pictures release, the topic of stigmatising those with mental illnesses is brought up once more, and it seems as though Shyamalan expected the conversation to come up. Much of the film sees Dr Fletcher (Betty Buckley) arguing for sufferers of disassociative identity disorder, and it seems as though this was an inclusion to show he isn't trying to stigmatise those suffering from D.I.D as a whole. Whether it works or not? I can't say that's up for me to decide. While his writing is far from perfect, M. Night deftly handles the direction, avoiding cheap jump scares to deliver on the tension (helped by some fantastic cinematography work from Mike Gioulakis). Less praise is delivered for the his forced cameo, as Shyamalan distracts a significant scene to talk about his love for Hooters chicken. Some turns and revelations feel like too much of a stretch, taking turns which feel a bit too fantastical for this tale. Thank goodness for a scene at the end, giving a great hint to make their inclusion feel satisfying. It's not the early 2000s, so I can't believe I'm about to type this, but M. Night Shyamalan has crafted an utterly fantastic film. Split is a chilling picture that delivers some tremendous performances, and is easily the best film Shyamalan has made in a good, long while.